This last election was a positive thing for the United States. There is now an entire branch of Congress with a new sense of relevancy, of power, and therefor perhaps of motivation to get off their dead asses and try to accomplish something. The Republican Party has been a long standing joke. After the Eisenhower and Nixon regimes it has been taken over by one outlandish group after another. First, the ‘Moral Majority’ (the power starved televangelist types), then the conservatives, then the neo-cons, the conservatives again and now the Tea Party. Yeah, the ‘Tea Party’. So now the Republicans, in their most recent iteration, have at least a seat in the game. Where before as the ‘minority party’ they were dead set on stopping anything and everything the Obama administration presented they now have no excuse whatsoever for failure to function. But can they function? Have they forgotten how to function? The Republican Party remains a joke but everyone here in the United States hopes that its members might one day soon become relevant, effective, maybe even worth a damn. The United States is, at the moment, off balance. It faces challenges in the Syria-Iraq theater as well as challenges in Ukraine. It does not have a clear response to either. It does not know what success in either theater would look like, what resources it is prepared to devote to either, nor whether the consequences of defeat would be manageable. A dilemma of this sort is not unusual for a global power. Its very breadth of interests and the extent of power create opportunities for unexpected events, and these events, particularly simultaneous challenges in different areas, create uncertainty and confusion. U.S. geography and power permit a degree of uncertainty without leading to disaster, but generating a coherent and integrated strategy is necessary, even if that strategy is simply to walk away and let events run their course. I am not suggesting the latter strategy but arguing that at a certain point, confusion must run its course and clear intentions must emerge. When they do, the result will be the coherence of a new strategic map that encompasses both conflicts. The most critical issue for the United States is to create a single integrated plan that takes into account the most pressing challenges. Such a plan must begin by defining a theater of operations sufficiently coherent geographically as to permit integrated political maneuvering and military planning. U.S. military doctrine has moved explicitly away from a two-war strategy. Operationally, it might not be possible to engage all adversaries simultaneously, but conceptually, it is essential to think in terms of a coherent center of gravity of operations. For me, it is increasingly clear that that center is the Black Sea. There are currently two active theaters of military action with broad potential significance. One is Ukraine, where the Russians have launched a counteroffensive toward Crimea. 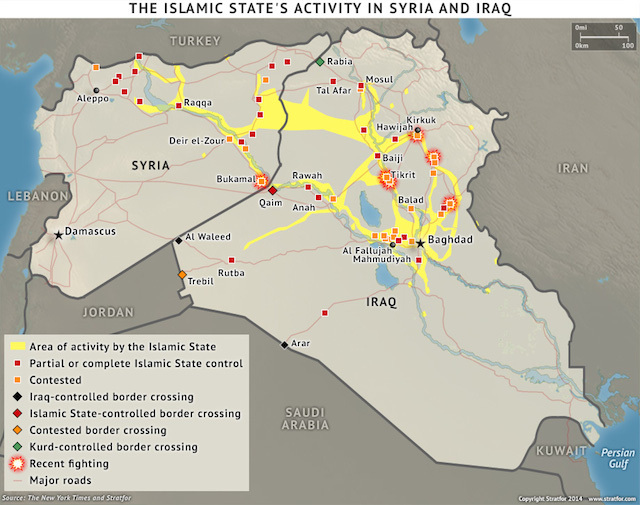 The other is in the Syria-Iraq region, where the forces of the Islamic State have launched an offensive designed at a minimum to control regions in both countries — and at most dominate the area between the Levant and Iran. In most senses, there is no connection between these two theaters. Yes, the Russians have an ongoing problem in the high Caucasus and there are reports of Chechen advisers working with the Islamic State. In this sense, the Russians are far from comfortable with what is happening in Syria and Iraq. At the same time, anything that diverts U.S. attention from Ukraine is beneficial to the Russians. For its part, the Islamic State must oppose Russia in the long run. Its immediate problem, however, is U.S. power, so anything that distracts the United States is beneficial to the Islamic State. But the Ukrainian crisis has a very different political dynamic from the Iraq-Syria crisis. Russian and Islamic State military forces are not coordinated in any way, and in the end, victory for either would challenge the interests of the other. But for the United States, which must allocate its attention, political will and military power carefully, the two crises must be thought of together. The Russians and the Islamic State have the luxury of focusing on one crisis. The United States must concern itself with both and reconcile them. The United States has been in the process of limiting its involvement in the Middle East while attempting to deal with the Ukrainian crisis. The Obama administration wants to create an integrated Iraq devoid of jihadists and have Russia accept a pro-Western Ukraine. It also does not want to devote substantial military forces to either theater. Its dilemma is how to achieve its goals without risk. If it can’t do this, what risk will it accept or must it accept? Strategies that minimize risk and create maximum influence are rational and should be a founding principle of any country. By this logic, the U.S. strategy ought to be to maintain the balance of power in a region using proxies and provide material support to those proxies but avoid direct military involvement until there is no other option. The most important thing is to provide the support that obviates the need for intervention. In the Syria-Iraq theater, the United States moved from a strategy of seeking a unified state under secular pro-Western forces to one seeking a balance of power between the Alawites and jihadists. In Iraq, the United States pursued a unified government under Baghdad and is now trying to contain the Islamic State using minimal U.S. forces and Kurdish, Shiite and some Sunni proxies. If that fails, the U.S. strategy in Iraq will devolve into the strategy in Syria, namely, seeking a balance of power between factions. It is not clear that another strategy exists. The U.S. occupation of Iraq that began in 2003 did not result in a military solution, and it is not clear that a repeat of 2003 would succeed either. Any military action must be taken with a clear outcome in mind and a reasonable expectation that the allocation of forces will achieve that outcome; wishful thinking is not permitted. Realistically, air power and special operations forces on the ground are unlikely to force the Islamic State to capitulate or to result in its dissolution. Ukraine, of course, has a different dynamic. The United States saw the events in Ukraine as either an opportunity for moral posturing or as a strategic blow to Russian national security. Either way, it had the same result: It created a challenge to fundamental Russian interests and placed Russian President Vladimir Putin in a dangerous position. His intelligence services completely failed to forecast or manage events in Kiev or to generate a broad rising in eastern Ukraine. Moreover, the Ukrainians were defeating their supporters (with the distinction between supporters and Russian troops becoming increasingly meaningless with each passing day). But it was obvious that the Russians were not simply going to let the Ukrainian reality become a fait accompli. They would counterattack. But even so, they would still have moved from once shaping Ukrainian policy to losing all but a small fragment of Ukraine. They will therefore maintain a permanently aggressive posture in a bid to recoup what has been lost. U.S. strategy in Ukraine tracks its strategy in Syria-Iraq. First, Washington uses proxies; second, it provides material support; and third, it avoids direct military involvement. Both strategies assume that the main adversary — the Islamic State in Syria-Iraq and Russia in Ukraine — is incapable of mounting a decisive offensive, or that any offensive it mounts can be blunted with air power. But to be successful, U.S. strategy assumes there will be coherent Ukrainian and Iraqi resistance to Russia and the Islamic State, respectively. If that doesn’t materialize or dissolves, so does the strategy. The United States is betting on risky allies. And the outcome matters in the long run. U.S. strategy prior to World Wars I and II was to limit involvement until the situation could be handled only with a massive American deployment. During the Cold War, the United States changed its strategy to a pre-commitment of at least some forces; this had a better outcome. The United States is not invulnerable to foreign threats, although those foreign threats must evolve dramatically. The earlier intervention was less costly than intervention at the last possible minute. Neither the Islamic State nor Russia poses such a threat to the United States, and it is very likely that the respective regional balance of power can contain them. But if they can’t, the crises could evolve into a more direct threat to the United States. And shaping the regional balance of power requires exertion and taking at least some risks. The rational move for countries like Romania, Hungary or Poland is to accommodate Russia unless they have significant guarantees from the outside. Whether fair or not, only the United States can deliver those guarantees. The same can be said about the Shia and the Kurds, both of whom the United States has abandoned in recent years, assuming that they could manage on their own. The issue the United States faces is how to structure such support, physically and conceptually. There appear to be two distinct and unconnected theaters, and American power is limited. The situation would seem to preclude persuasive guarantees. But U.S. strategic conception must evolve away from seeing these as distinct theaters into seeing them as different aspects of the same theater: the Black Sea. When we look at a map, we note that the Black Sea is the geographic organizing principle of these areas. The sea is the southern frontier of Ukraine and European Russia and the Caucasus, where Russian, jihadist and Iranian power converge on the Black Sea. Northern Syria and Iraq are fewer than 650 kilometers (400 miles) from the Black Sea. The United States has had a North Atlantic strategy. It has had a Caribbean strategy, a Western Pacific strategy and so on. This did not simply mean a naval strategy. Rather, it was understood as a combined arms system of power projection that depended on naval power to provide strategic supply, delivery of troops and air power. It also placed its forces in such a configuration that the one force, or at least command structure, could provide support in multiple directions. The United States has a strategic problem that can be addressed either as two or more unrelated problems requiring redundant resources or a single integrated solution. It is true that the Russians and the Islamic State do not see themselves as part of a single theater. But opponents don’t define theaters of operation for the United States. The first step in crafting a strategy is to define the map in a way that allows the strategist to think in terms of unity of forces rather than separation, and unity of support rather than division. It also allows the strategist to think of his regional relationships as part of an integrated strategy. Assume for the moment that the Russians chose to intervene in the Caucasus again, that jihadists moved out of Chechnya and Dagestan into Georgia and Azerbaijan, or that Iran chose to move north. The outcome of events in the Caucasus would matter greatly to the United States. Under the current strategic structure, where U.S. decision-makers seem incapable of conceptualizing the two present strategic problems, such a third crisis would overwhelm them. But thinking in terms of securing what I’ll call the Greater Black Sea Basin would provide a framework for addressing the current thought exercise. A Black Sea strategy would define the significance of Georgia, the eastern coast of the Black Sea. Even more important, it would elevate Azerbaijan to the level of importance it should have in U.S. strategy. Without Azerbaijan, Georgia has little weight. With Azerbaijan, there is a counter to jihadists in the high Caucasus, or at least a buffer, since Azerbaijan is logically the eastern anchor of the Greater Black Sea strategy. A Black Sea strategy would also force definition of two key relationships for the United States. The first is Turkey. Russia aside, Turkey is the major native Black Sea power. It has interests throughout the Greater Black Sea Basin, namely, in Syria, Iraq, the Caucasus, Russia and Ukraine. Thinking in terms of a Black Sea strategy, Turkey becomes one of the indispensible allies since its interests touch American interests. Aligning U.S. and Turkish strategy would be a precondition for such a strategy, meaning both nations would have to make serious policy shifts. An explicit Black Sea-centered strategy would put U.S.-Turkish relations at the forefront, and a failure to align would tell both countries that they need to re-examine their strategic relationship. At this point, U.S.-Turkish relations seem to be based on a systematic avoidance of confronting realities. With the Black Sea as a centerpiece, evasion, which is rarely useful in creating realistic strategies, would be difficult. The second critical country is Romania. The Montreux Convention prohibits the unlimited transit of a naval force into the Black Sea through the Bosporus, controlled by Turkey. Romania, however, is a Black Sea nation, and no limitations apply to it, although its naval combat power is centered on a few aging frigates backed up by a half-dozen corvettes. Apart from being a potential base for aircraft for operations in the region, particularly in Ukraine, supporting Romania in building a significant naval force in the Black Sea — potentially including amphibious ships — would provide a deterrent force against the Russians and also shape affairs in the Black Sea that might motivate Turkey to cooperate with Romania and thereby work with the United States. The traditional NATO structure can survive this evolution, even though most of NATO is irrelevant to the problems facing the Black Sea Basin. Regardless of how the Syria-Iraq drama ends, it is secondary to the future of Russia’s relationship with Ukraine and the European Peninsula. Poland anchors the North European Plain, but the action for now is in the Black Sea, and that makes Romania the critical partner in the European Peninsula. It will feel the first pressure if Russia regains its position in Ukraine. I have written frequently on the emergence — and the inevitability of the emergence — of an alliance based on the notion of the Intermarium, the land between the seas. It would stretch between the Baltic and Black seas and would be an alliance designed to contain a newly assertive Russia. I have envisioned this alliance stretching east to the Caspian, taking in Turkey, Georgia and Azerbaijan. The Poland-to-Romania line is already emerging. It seems obvious that given events on both sides of the Black Sea, the rest of this line will emerge. The United States ought to adopt the policy of the Cold War. That consisted of four parts. First, allies were expected to provide the geographical foundation of defense and substantial forces to respond to threats. Second, the United States was to provide military and economic aid as necessary to support this structure. Third, the United States was to pre-position some forces as guarantors of U.S. commitment and as immediate support. And fourth, Washington was to guarantee the total commitment of all U.S. forces to defending allies, although the need to fulfill the last guarantee never arose. The United States has an uncertain alliance structure in the Greater Black Sea Basin that is neither mutually supportive nor permits the United States a coherent power in the region given the conceptual division of the region into distinct theaters. The United States is providing aid, but again on an inconsistent basis. Some U.S. forces are involved, but their mission is unclear, it is unclear that they are in the right places, and it is unclear what the regional policy is. Thus, U.S. policy for the moment is incoherent. A Black Sea strategy is merely a name, but sometimes a name is sufficient to focus strategic thinking. So long as the United States thinks in terms of Ukraine and Syria and Iraq as if they were on different planets, the economy of forces that coherent strategy requires will never be achieved. Thinking in terms of the Black Sea as a pivot of a single diverse and diffuse region can anchor U.S. thinking. Merely anchoring strategic concepts does not win wars, nor prevent them. But anything that provides coherence to American strategy has value. The Greater Black Sea Basin, as broadly defined, is already the object of U.S. military and political involvement. It is just not perceived that way in military, political or even public and media calculations. It should be. For that will bring perception in line with fast-emerging reality. The Islamic State, previously known as the Islamic State in Iraq and the Levant, has changed its name, but otherwise the militant group remains the same. Over the past weekend, a spokesman for the group announced that it had established a caliphate stretching from Diyala province, Iraq, to Aleppo, Syria. The caliphate is a political institution that the Islamic State claims will govern the global Muslim community. “Iraq” and “Levant” have been dropped from the organization’s name to reflect its new status. 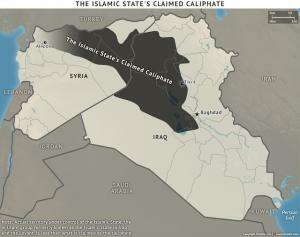 The trouble with the announcement is that the Islamic State does not have a caliphate and probably never will. No amount of new monikers will change the fact that geography, political ideology and religious, cultural and ethnic differences will prevent the emergence of a singular polity capable of ruling the greater Middle East. Transnational jihadist groups can exploit weakened autocratic states, but they cannot institutionalize their power enough to govern such a large expanse of land. If anything, the Islamic State’s drive to unify the Middle East will actually create more conflicts than it will end as competing emirates vie for power in the new political environment. In recent years, the term “caliphate” has become somewhat warped; it has become more of a slogan for radical Islamist groups than an actual political objective. Even the Islamic State, which has made impressive territorial gains quickly, has only an emirate, which encompasses a far smaller geographic area than a caliphate. Establishing an emirate is not terribly remarkable. Similar groups have established emirates before: The Taliban ruled more than 90 percent of Afghanistan prior to 9/11, and al Qaeda franchise groups oversaw short-lived emirates in Yemen and Mali. Still, the Islamic State’s announcement is the first serious attempt at re-establishing the caliphate since the institution was abolished in 1924 by the Turkish republic, which replaced the Ottoman Empire after World War I. Over the past 90 years, there have been a few attempts to revive the caliphate, but none were particularly successful. Notable examples include Hizb al-Tahrir, which rejects democracy and nationalism, and more recently, al Qaeda. Caliphate is derived from the Arabic word for “successor,” a designation for those who would govern the Muslim community after the Prophet Mohammed died. However, Mohammed did not appoint his political successor; such a person was supposed to be elected by the community. Differences quickly emerged as to who should lead the Muslims subsequently. One camp preferred Mohammed’s closest associate, Abu Bakr, while another camp favored Mohammed’s cousin and son-in-law, Ali. The group loyal to Abu Bakr would later be known as Sunni, and the group loyal to Ali would later be known as Shia. But neither group knew exactly how it wanted a caliphate to function. Centuries later, the Shia developed a theory whereby the leadership of the community is not political, but rather divinely ordained. Even among the Sunnis, the caliphate was not a neatly outlined system of government. Their texts include only general principles for politics and governance; most practices were developed as the situation arose. Abu Bakr eventually became the first successor, or “caliph,” in 632. After roughly two years in office, he died of natural causes and another top lieutenant of Mohammed, Omar, took over. He was assassinated a decade later, but not before he appointed a council of six men to elect his replacement. They chose a man named Uthman, during whose tenure Islam saw its first significant, and violent, political disagreements, which ultimately led to Uthman’s assassination. Ali succeeded Uthman, but by that time the divisions within the caliphate had worsened beyond repair, leaving Ali to manage three separate civil wars. He, too, was later assassinated, bringing an end to what was known as the Rashidun caliphate and giving rise to the Umayyad caliphate. As an institution, the caliphate would continue to be central to Islam for some time. But it declined well before the modern era. In Egypt, the Mamluks (1250-1517) kept the term caliphate more for religious symbolism than political necessity; their authority came from military power rather than from pledges of the faithful. Even the Ottoman Empire was more akin to a sultanate. It was not until 1517, when Sultan Selim I defeated the Mamluks, that the Ottoman sultans assumed the title of caliph. But even then, the caliphate lay dormant until Sultan Abdul-Hamid II unsuccessfully tried to revive it in 1876. When the caliphate was abolished in 1924, it had not really existed for centuries. Truthfully, the caliphate was nearly always in flux. Even during the Abbasid era (749-1258), which is considered the golden age of the caliphate, autonomous and sometimes independent emirates and sultanates threatened the central government. The Abbasids overthrew the Ummayads, but the Ummayads maintained a rival caliphate on the Iberian Peninsula from 929 to 1031. At roughly the same time, another rival caliphate led by the Fatimid dynasty based itself in Cairo (909-1171). In actuality, a single entity able to rule the entire Muslim world did not exist but for a brief period of early Islamic history. Geography constrained every regime. For a while, the caliphs in Medina, Kufa, Damascus, and Baghdad ruled large expanses through a sort of provincial system, but over time provincial rulers accrued power and in some cases independence. These rulers would sometimes ally with the caliph, but their loyalties would change as other power centers emerged. As a concept, the caliphate has evolved throughout history. The basis for Sunni jurisprudence was formed during Mohammed’s rule and the Rashidun era. But interestingly, no caliphate ever referred to itself as the “Islamic State,” though the Ottomans adorned honorific names like “The Exalted State.” The notion of an Islamic state is actually a modern development, a response to the rise of the secular nation-state. Of course, not all Muslims advocate the creation of an Islamic state any more than they reject the nation-state. And even those that do agree in principle may disagree on the methods used to create it. Radical groups like Hizb al-Tahrir and the Islamic State want to replace the nation-state with a caliphate. Moderates may take a more measured approach. But all this points to a larger issue: The role of Islam in politics remains unsettled. Most Muslims have embraced such ideals as nationalism, republicanism and democracy. But radical groups are as relevant as ever, due in no small part to the rise of secular authoritarianism, Islamism, the failure of Arab/Muslim states to build viable political economies, the Arab-Israeli conflict and the U.S. wars in the Muslim world. These issues have helped militant Islamists drum up support, vying for a return to the past by restoring the caliphate. Until now, calls for its restoration were disregarded as propaganda. In light of the Syrian civil war and the Sunni insurgency in Iraq, such calls are arguably much more significant. The Islamic State knows it probably cannot create a caliphate, but simply saying as much benefits the group tactically: It stokes fear in the West and, considering it was announced during the first weekend of Ramadan, it appeals to Muslim sensibilities. Plenty of Muslims, Islamists and jihadists reject the Islamic State. But for now, the group wants to use the caliphate to consolidate control over newly acquired territory. In the long run, the declaration of the caliphate also helps the group to resurrect the concept in political discourse, especially as the region is in such disarray. The Islamic State knows the declaration of a caliphate and a caliph is an issue that the Muslim world will have to address as it reconciles the role of Islam in politics. Needless to say the Glass-Steagall Act should never have been repealed. So here is a write-up on one of the many little rules which have come down since the repeal that attempt to make it all OK. More on this later. Now comes the Volcker rule from the SEC and four other federal regulatory agencies, acting in response to instructions by Congress in the Dodd-Frank Act. (That would be the 2010 law that promised to end too-big-to-fail and didn’t.) The Volcker rule promises to end proprietary trading by federally insured banks, except in those instances when it doesn’t. And there’s some merit to having a ban: Lots of people dislike the idea of banks gambling with federally insured customer deposits, because they might blow themselves up and either cause damage to others or require a taxpayer bailout. A deal between Iran and the P-5+1 (the five permanent members of the U.N. Security Council plus Germany) was reached Saturday night. The Iranians agreed to certain limitations on their nuclear program while the P-5+1 agreed to remove certain economic sanctions. The next negotiation, scheduled for six months from now depending on both sides’ adherence to the current agreement, will seek a more permanent resolution. The key players in this were the United States and Iran. The mere fact that the U.S. secretary of state would meet openly with the Iranian foreign minister would have been difficult to imagine a few months ago, and unthinkable at the beginning of the Islamic republic. The U.S. goal is to eliminate Iran’s nuclear weapons before they are built, without the United States having to take military action to eliminate them. While it is commonly assumed that the United States could eliminate the Iranian nuclear program at will with airstrikes, as with most military actions, doing so would be more difficult and riskier than it might appear at first glance. The United States in effect has now traded a risky and unpredictable air campaign for some controls over the Iranian nuclear program. The Iranians’ primary goal is regime preservation. While Tehran managed the Green Revolution in 2009 because the protesters lacked broad public support, Western sanctions have dramatically increased the economic pressure on Iran and have affected a wide swath of the Iranian public. It isn’t clear that public unhappiness has reached a breaking point, but were the public to be facing years of economic dysfunction, the future would be unpredictable. The election of President Hassan Rouhani to replace Mahmoud Ahmadinejad after the latter’s two terms was a sign of unhappiness. Supreme Leader Ali Khamenei clearly noted this, displaying a willingness to trade a nuclear program that had not yet produced a weapon for the elimination of some sanctions. The logic here suggests a process leading to the elimination of all sanctions in exchange for the supervision of Iran’s nuclear activities to prevent it from developing a weapon. Unless this is an Iranian trick to somehow buy time to complete a weapon and test it, I would think that the deal could be done in six months. An Iranian ploy to create cover for building a weapon would also demand a reliable missile and a launch pad invisible to surveillance satellites and the CIA, National Security Agency, Mossad, MI6 and other intelligence agencies. The Iranians would likely fail at this, triggering airstrikes however risky they might be and putting Iran back where it started economically. While this is a possibility, the scenario is not likely when analyzed closely. While the unfolding deal involves the United States, Britain, France, China, Russia and Germany, two countries intensely oppose it: Israel and Saudi Arabia. Though not powers on the order of the P-5+1, they are still significant. There is a bit of irony in Israel and Saudi Arabia being allied on this issue, but only on the surface. Both have been intense enemies of Iran, and close allies of the United States; each sees this act as a betrayal of its relationship with Washington. In a way, this marks a deeper shift in relations with Saudi Arabia than with Israel. Saudi Arabia has been under British and later American protection since its creation after World War I. Under the leadership of the Sauds, it became a critical player in the global system for a single reason: It was a massive producer of oil. It was also the protector of Mecca and Medina, two Muslim holy cities, giving the Saudis an added influence in the Islamic world on top of their extraordinary wealth. It was in British and American interests to protect Saudi Arabia from its enemies, most of which were part of the Muslim world. The United States protected the Saudis from radical Arab socialists who threatened to overthrow the monarchies of the Arabian Peninsula. It later protected Saudi Arabia from Saddam Hussein after he invaded Kuwait. But it also protected Saudi Arabia from Iran. Absent the United States in the Persian Gulf, Iran would have been the most powerful regional military power. In addition, the Saudis have a substantial Shiite minority concentrated in the country’s oil-rich east. The Iranians, also Shia, had a potential affinity with them, and thereby the power to cause unrest in Saudi Arabia. Until this agreement with Iran, the United States had an unhedged commitment to protect Saudi Arabia from the Iranians. Given the recent deal, and potential follow-on deals, this commitment becomes increasingly hedged. The problem from the Saudi point of view is that while there was a wide ideological gulf between the United States and Iran, there was little in the way of substantial issues separating Washington from Tehran. The United States did not want Iran to develop nuclear weapons. The Iranians didn’t want the United States hindering Iran’s economic development. The fact was that getting a nuclear weapon was not a fundamental Iranian interest, and crippling Iran’s economy was not a fundamental interest to the United States absent an Iranian nuclear program. If the United States and Iran can agree on this quid pro quo, the basic issues are settled. And there is something drawing them together. The Iranians want investment in their oil sector and other parts of their economy. American oil companies would love to invest in Iran, as would other U.S. businesses. As the core issue separating the two countries dissolves, and economic relations open up — a step that almost by definition will form part of a final agreement — mutual interests will appear. There are other significant political issues that can’t be publicly addressed. The United States wants Iran to temper its support for Hezbollah’s militancy, and guarantee it will not support terrorism. The Iranians want guarantees that Iraq will not develop an anti-Iranian government, and that the United States will work to prevent this. (Iran’s memories of its war with Iraq run deep.) The Iranians will also want American guarantees that Washington will not support anti-Iranian forces based in Iraq. From the Saudi point of view, Iranian demands regarding Iraq will be of greatest concern. Agreements or not, it does not want a pro-Iranian Shiite state on its northern border. Riyadh has been funding Sunni fighters throughout the region against Shiite fighters in a proxy war with Iran. Any agreement by the Americans to respect Iranian interests in Iraq would represent a threat to Saudi Arabia. From the Israeli point of view, there are two threats from Iran. One is the nuclear program. The other is Iranian support not only for Hezbollah but also for Hamas and other groups in the region. Iran is far from Israel and poses no conventional military threat. The Israelis would be delighted if Iran gave up its nuclear program in some verifiable way, simply because they themselves have no reliable means to destroy that program militarily. What the Israelis don’t want to see is the United States and Iran making deals on their side issues, especially the political ones that really matter to Israel. The Israelis have more room to maneuver than the Saudis do. Israel can live with a pro-Iranian Iraq. The Saudis can’t; from their point of view, it is only a matter of time before Iranian power starts to encroach on their sphere of influence. The Saudis can’t live with an Iranian-supported Hezbollah. The Israelis can and have, but don’t want to; the issue is less fundamental to the Israelis than Iraq is to the Saudis. But in the end, this is not the problem that the Saudis and Israelis have. Their problem is that both depend on the United States for their national security. Neither country can permanently exist in a region filled with dangers without the United States as a guarantor. Israel needs access to American military equipment that it can’t build itself, like fighter aircraft. Saudi Arabia needs to have American troops available as the ultimate guarantor of their security, as they were in 1990. Israel and Saudi Arabia have been the two countries with the greatest influence in Washington. As this agreement shows, that is no longer the case. Both together weren’t strong enough to block this agreement. What frightens them the most about this agreement is that fact. If the foundation of their national security is the American commitment to them, then the inability to influence Washington is a threat to their national security. There are no other guarantors available. Israeli Prime Minister Benjamin Netanyahu went to Moscow, clearly trying to get the Russians to block the agreement. He failed. But even if he had succeeded, he would have alienated the United States, and would have gotten instead a patron incapable of supplying the type of equipment Israel might need when Israel might need it. The fact is that neither the Saudis nor the Israelis have a potential patron other than the United States. The United States is not abandoning either Israel or Saudi Arabia. A regional policy based solely on the Iranians would be irrational. What the United States wants to do is retain its relationship with Israel and Saudi Arabia, but on modified terms. The modification is that U.S. support will come in the context of a balance of power, particularly between Iran and Saudi Arabia. While the United States is prepared to support the Saudis in that context, it will not simply support them absolutely. The Saudis and Israelis will have to live with things that they have not had to live with before — namely, an American concern for a reasonably strong and stable Iran regardless of its ideology. The American strategy is built on experience in Iraq and Afghanistan. Washington has learned that it has interests in the region, but that the direct use of American force cannot achieve those goals, partly because imposing solutions takes more force than the United States has and partly because the more force it uses, the more resistance it generates. Therefore, the United States needs a means of minimizing its interests, and pursuing those it has without direct force. With its interests being limited, the United States’ strategy is a balance of power. The most natural balance of power is Sunni versus Shia, the Arabs against the Iranians. The goal is not war, but sufficient force on each side to paralyze the other. In that sense, a stable Iran and a more self-reliant Saudi Arabia are needed. Saudi Arabia is not abandoned, but nor is it the sole interest of the United States. In the same sense, the United States is committed to the survival of Israel. If Iranian nuclear weapons are prevented, the United States has fulfilled that commitment, since there are no current threats that could conceivably threaten Israeli survival. Israel’s other interests, such as building settlements in the West Bank, do not require American support. If the United States determines that they do not serve American interests (for example, because they radicalize the region and threaten the survival of Jordan), then the United States will force Israel to abandon the settlements by threatening to change its relationship with Israel. If the settlements do not threaten American interests, then they are Israel’s problem. Israel has outgrown its dependence on the United States. It is not clear that Israel is comfortable with its own maturation, but the United States has entered a new period where what America wants is a mature Israel that can pursue its interests without recourse to the United States. And if Israel finds it cannot have what it wants without American support, Israel may not get that support, unless Israel’s survival is at stake. In the same sense, the perpetual Saudi inability to create an armed force capable of effectively defending itself has led the United States to send troops on occasion — and contractors always — to deal with the problem. Under the new strategy, the expectation is that Saudi soldiers will fight Saudi Arabia’s wars — with American assistance as needed, but not as an alternative force. With this opening to Iran, the United States will no longer be bound by its Israeli and Saudi relationships. They will not be abandoned, but the United States has broader interests than those relationships, and at the same time few interests that rise to the level of prompting it to directly involve U.S. troops. The Saudis will have to exert themselves to balance the Iranians, and Israel will have to wend its way in a world where it has no strategic threats, but only strategic problems, like everyone else has. It is not a world in which Israeli or Saudi rigidity can sustain itself. Israelis, Saudis and the Iranian Agreement is republished with permission of Stratfor.